Heavy metals can stay in the soil for a long time and are difficult to clean up. The problem is when crops absorb the heavy metals and in turn these crops are ingested by humans. Cancer Villages In 2013, the MEP officially mentioned “cancer villages” and linked it to heavy metal discharge from industry. Almost half of China’s COD (chemical oxygen demand) and one-third of ammonium discharge come from agriculture. This discharge is mostly related to fertiliser use. China leads global fertiliser use at 31% but only accounts for 8% of global arable land. Key targets are: 1) To curb worsening soil pollution by 2020, control soil pollution risks by 2030 & create a virtuous cycle in the ecosystem by 2050; and 2) To ensure that >90% of contaminated land can be utilised safely by 2020 & increase this to 95% by 2030. Food Safety law – China enacted its revised Food Safety Law in October 2015, imposing tougher consequences on violators of food safety regulations and mandating more frequent inspections on food producers. 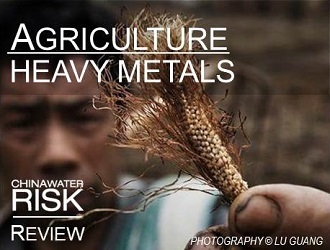 Check out the status of heavy metals & agriculture. What crops are exposed? Which industries have to clean-up?